Artist’s concept of a planet where one side always faces its star, with the dark side covered in ice. Alien worlds resembling giant eyeballs might exist around red dwarf stars, and researchers are now proposing experiments to simulate these distant planets and see how capable they are of supporting life. Red dwarfs are small, faint stars about one-fifth as massive as the sun and up to 50 times dimmer. They are the most common stars in the galaxy and are thought to make up to 70 percent of the stars in the universe — vast numbers that potentially make them valuable places to look for extraterrestrial life. When looking for alien life as we know it, scientists typically focus on worlds that have water, since there is life virtually everywhere there is water on Earth. As such, they concentrate on the habitable zone of a star — the area surrounding a star where it is neither too hot nor too cold for liquid water to exist on a planet's surface. Since red dwarfs are relatively cool, their habitable zones are often closer than the distance at which Mercury orbits the sun. This makes it relatively easy for astronomers to spot worlds in a red dwarf's habitable zone — the exoplanets' orbits are small, meaning they complete them quickly and often, and researchers can in principle readily detect the way these worlds regularly dim the light of these stars. When a planet orbits a star very closely, the gravitational pull of the star can force the world to become tidally locked with it. "This means that they always show the same side to their star just as our moon does to the Earth, which means they have one permanent day and one permanent night side," study lead author Daniel Angerhausen, an astronomer and astrobiologist at Rensselaer Polytechnic Institute, Troy, N.Y., told Astrobiology Magazine. Transition zones - geographical areas that shift from mainly ice to mainly rock - such as this location in Antarctica, could provide some real-world data about eyeball Earths. "For me, the eyeballs are just one example of the plethora of crazy things we are finding out there in space," Angerhausen said. "In the field of exoplanets we find hot Jupiters, highly eccentric planets that light up like comets when they come close in to their host star, or evaporating Mercurys — all of them planets that we don't have in our solar system and that astronomers did not even dream about 10 or 20 years ago." 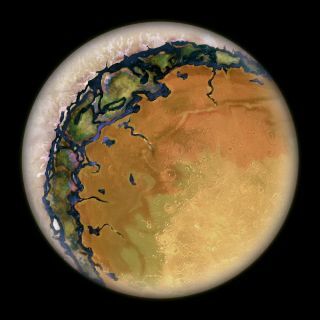 The idea of an eyeball Earth, as such a world is called, was spurred by the detection of an exoplanet called Gliese 581g about 20 light-years away, which may be the first known potentially habitable alien world (although scientists continue to debate whether the planet really exists). Planetary geophysicist Raymond Pierrehumbert of the University of Chicago suggested that if Gliese 581g is real, it could be an eyeball Earth. "We already have telescopes that detect planets that might be eyeballs," Angerhausen said. Given the profound differences between the day and night sides of eyeball Earths, "they are potentially the easiest habitable terrestrial planets to detect and distinguish," Angerhausen said. However, little is known about precisely how easy they are to detect and how habitable they really are. "Our proposal will find out how common and stable these eyeballs are," Angerhausen said. To learn more about what eyeball Earths might be like, Angerhausen and his colleagues are proposing a project they hope to carry out in Brazil dubbed HABEBEE, short for "Exploring the Habitability of Eyeball-Exo-Earths." The plan is to for the first time see what a stable eyeball Earth needs to support life. The scientists first aim to construct a variety of eyeball Earth models that vary in mass, distance from their stars, how much radiation they receive, magnetic field strength and their ice composition and density. By providing general and extreme cases of stable and transient eyeball Earths, they can help predict how well existing and future telescope surveys can detect and characterize them. An eyeball planet is one of several possible scenarios for planets in a red dwarf's habitable zone. "A little bit closer to the star — that is, hotter — they would completely thaw and become water worlds; a little bit further out in the habitable zone — that is, colder — they would become total iceballs just like [Jupiter's moon] Europa, but with a potential for life under the ice crust," Angerhausen said. "These planets — water, eyeball or snowball — will most probably be the first habitable planets we will find and be able to characterize remotely. Thats why it is so important to study them now." The researchers also plan an expedition to the Antarctic Peninsula to gather specimens of microbes at transition zones between ice and water that might be analogous to oceans on eyeball Earths. The aim is to see what metabolism of life on the alien worlds might be like. The researchers finally aim to see how well life can survive on eyeball Earths using an existing planetary simulation chamber originally designed to imitate Mars at the Brazilian Astrobiology Laboratory. Antarctic microbe samples can be tested in atmospheric, radiation and other conditions that simulate a number of possible eyeball Earth scenarios. The researchers can test the survival and genetic activity of the microbes to see how well they behave. "I like the idea of having a few cubic meters of space that mimic another world in a chamber," Angerhausen said. "It's like having a probe from a world light years away in a jar." Over the course of their lifetimes, red dwarfs can go from barely to highly active when it comes to dangerous bursts and flares, causing ultraviolet radiation to jump by 100 to 10,000 times normal levels and potentially sterilizing the surface of a nearby planet or even helping to strip off its atmosphere. To see what harm such radiation might wreak on the habitability of eyeball Earths, the researchers plan to monitor the radiation levels of known red dwarfs over time and investigate previously gathered red dwarf radiation data, knowledge that can help them simulate red dwarfs better. They also plan on understanding the effects of streams of energetic particles from red dwarfs on the surfaces and atmospheres of eyeball Earths by using the Brazilian National Synchrotron Light Source at Campinas to blast ice with radiation. "It is not obvious that these planets could be stable for long periods, which we believe is necessary for the origin, maintenance and evolution of life," said astrobiologist Douglas Galante at the Brazilian Synchrotron Light Source, who organized the Sao Paulo Advanced School of Astrobiology where Angerhausen and his colleagues initiated the HABEBEE proposal. "Many more studies have to be done, theoretical, experimental and observational, so that we better understand the habitability of these planets," Galante added. Upcoming and current telescopes such as NASA's James Webb Space Telescope might be able to see if planets have eyeball structures. When telescopes improve further, astronomers could look for molecular signs of life on eyeball Earths, researchers said. "To finally detect life or what we call ‘biomarkers,’ we probably have to wait for next-generation telescopes, such as the 30-meter-class ground-based telescopes that are currently getting built and future space-based platforms such as the Terrestrial Planet Finder," Angerhausen said. "However, history shows that astronomers are quite creative using current available instruments and telescopes, so maybe one of my colleagues may come up with a new exciting observation strategy that will make it even possible earlier." The scientists detailed their findings in the March issue of the journal Astrobiology.